Bags are round and compact with side pockets and a big front pocket in replica leather. Features which make this bag elegant and stylish. Equipped with a “fire retardent” base that contrasts the close position th the exhaust pipe. Waterproof cover included. Material: Polyester 168OD finished in synthetic leather. Mounting Kit: adjustable Velcro straps and elastic bends for attaching the bag to the bike. These soft-luggage from Kappa really do look the part, very well made and robust too. Whilst they are specifically designed as motorcycle luggage they would not look out of place in the office and also doubles up as hand luggage. With a shoulder carrying strap and handle, they are very adaptable and useful in any environment. Internal straps will keep your laptop or ipad secure and waterproof covers will protect it from the UK elements. There are a multitude of internal pockets and compartments for those small, loose items plus two padded external pockets to keep your smartphone safe. Panniers are expandable for extra luggage space. Bungy straps are included to help keep the panniers secure on the back of the bike, as well as built-in Kappa straps. Please note you many need to buy extra securing straps to suit your bike. They are universal but do not fit all motorcycles so be careful before ordering, they are specifically designed for tourers and scooters. A superb leather-like finish give them a very elegant look, you probably wouldn want to leave them in the rain too long but thats what the waterproof covers are for! 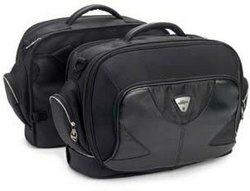 At almost £170, they aren the cheapest soft luggage you will find for your motorcycle but the design and build quality really do shine through and is worth the investment with the multi-purpose functionality. Manufacturers 24-month warranty is included against manufacturing defects.